Jody Daily Signed and Numbered Giclée on Paper : "See Woody in Toy Story 3"
About The Artist: While Disney fans best know artist Jody Daily through his Disneyland art and collectibles, which he creates with his partner Kevin Kidney, it is his designs for theater and theme park entertainment that occupy most of his time. Currently he and Kevin are art directing a brand new musical parade for Disneyland® Park called Soundsational. No stranger to the world of Pixar, Jody designed the Pixar Play Parade for Disney's California Adventure® theme park, and in 2009 Jody and Kevin were called upon by John Lasseter's team to create the packaging for Toy Story's definitive toy line. 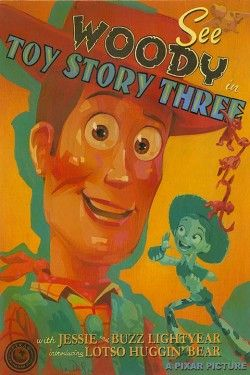 For his new painting of Woody, Jody turned to classic hand-painted movie poster art of the 1930s and 40s for inspiration. "My own personal style seems to go toward whimsical children's book illustration, but I get really excited by the challenge of working in many different styles, from gothic to modern. I really just try to be a chameleon and create things that look authentic to whatever time and genre I'm aiming for, and keep my own present-day aesthetic out of it!"